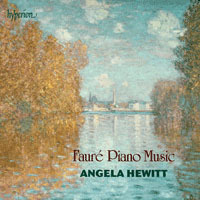 Angela Hewitt now turns her attention to another French composer, Gabriel Fauré. This album includes the Thème et variations, Op 73 – one of Fauré’s greatest works for piano – and a selection of Valses-caprices and Nocturnes. It ends with a more radiant piece from Fauré’s youth, the earliest piece included on this recording – the Ballade pour piano seul, Op 19, dedicated to Saint-Saëns.